Without really thinking it through, most people separate the practical side of their lives from their spiritual beliefs. This separation is actually not valid. No matter what kind of experience you are having, that experience occurs in awareness. Therefore, spirituality needs to be clarified in terms of consciousness, which is real and practical, instead of religious beliefs. Beliefs can be very important to someone and have a deep personal meaning. But the source of every spiritual experience is consciousness. The first thing to say is that consciousness is active at every level of life, not just in our everyday thoughts and sensations. What are you conscious of right this minute? To find an answer you can look at the world “out there” and describe what you see and hear, or you can refer to the world “in here” and describe what you are feeling and thinking about. Yet this separation, which seems so obvious, isn’t really crucial. Being aware of a tree is much the same as being aware of an image of a tree in your mind’s eye. The sight of a grocery store may remind you that you need eggs–the two worlds of “out there” and “in here” are intimately connected and function as two sides of the same coin. But there is another kind of awareness one might call “second attention.” While all the things you notice fall into the area of first attention, second attention is different and unique. It is your awareness of being aware. We all have this. When you wake up in the morning the first thing you are aware of is being awake, not whatever is in your bedroom or the thoughts that start running through your head. Second attention sounds abstract, but it indicates something important that applies to you personally: Consciousness is multi-dimensional. This isn’t an incidental observation but a key one in the world’s wisdom traditions. If consciousness is multi-dimensional, the way you easily switch from first to second attention opens the door to a completely new reality. 1. Your two levels of attention are constantly at work. While the first level deals with events in the everyday world, the second level governs and controls how your personal reality unfolds; it contains the control switch that pulls your attention wherever it goes, and what you pay attention to is all-important. How much focus you place on these two levels makes an immense difference in how your life turns out. 2. You can absent yourself from pain and suffering by transcending or going beyond your immediate circumstances. This ability leads directly into the deep meditative states extolled in every spiritual tradition. 3. You can experience two states of mind simultaneously, encompassing both the active mind with its thoughts, images, feelings, and sensations and the silent mind from which all activity springs. 4. 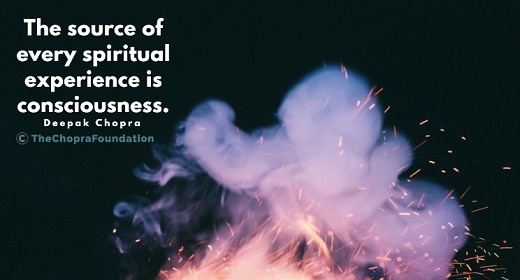 You can explore the numinous or divine nature of the mind, where silence turns into “light,” a symbol for the ultimate source of all things, including the physical universe. This is the goal of the Old Testament injunction, “Be still and know that I am God.” Stripped of religious overtones, such an experience brings you to the ground state of your own being. 5. Through empathy, you can feel how another person is feeling, and if carried far enough, this natural ability turns into compassion. Through compassion the individual exchanges his or her allegiance to the isolated ego and becomes aligned instead with a deeper core of humanity. It needs repeating that all of these are natural states of awareness that anyone can experience once they are pointed out. There is nothing mystical about first and second attention. Of what use is this information and the experiences that follow? Each person must decide individually, but in general, the value of being multi-dimensional is summarized by a New Testament promise: Knock and the door will be opened to you. This refers to doors of higher awareness, leading to greater creativity, intelligence, and love. A person also coordinates daily life better from a deeper level of awareness. Ultimately, the goal is to be so aware that all dimensions are in sync — in separation the mind gets out of joint with its true source, which is why worldly success isn’t the same as peace of mind or self-knowledge. In short, a lot depends on whether you have realized that you are multi-dimensional and not simply a creature of linear time unfolding on a single track. This is a secret that is capable of transforming your life.